If you need a residential mains power upgrade in North Brisbane, Armitage Electrical can help. We specialise in residential mains upgrades, and will ensure you have a safe, consistent and adequate power source for your property. We’re known for our exceptional workmanship, on time and reliable service, and for our competitive prices. 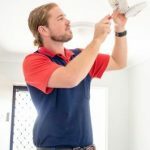 If you’re installing a pool, spa, shed, or air con and need a cost-effective mains upgrade, contact Cameron from Armitage Electrical on 0433 578 622 for a free quote or simply enquire online. We’re often asked why you would need a mains upgrade. Mains upgrades are common in older properties and are typically required to service the modern home’s increased energy needs. There are many reasons you might need your mains power upgraded, such as installing air conditioning to your property, adding a pool or spa, or even running power to your shed. Armitage Electrical can also install a sub main or sub board for power to a separate unit, granny flat or shed. If you need a residential mains upgrade for your property, contact Armitage Electrical for a free quote today. We’ll provide recommendations to upgrade your residential mains power at a competitive price. We specialise in cost-effective residential mains and switchboard upgrades and are known for our quality workmanship and reliable service.